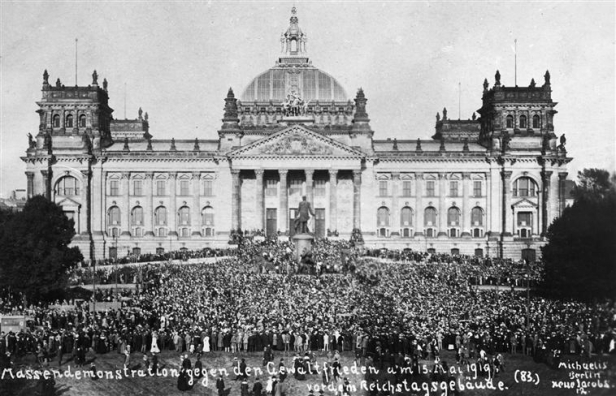 With Germany and her allies defeated, a treaty would need to be set up to decide what the outcome of the war would be. The result was, the Treaty of Versailles. The British Prime Minister believed in a hard line on the defeated Germany in public but in private was fearful of making Germany too weak and vengeful in the wake of the rise of communism in Russia. He saw the nation as a barrier to stopping the spread of extreme left wing politics. The French Prime Minister was much more hardline than Lloyd George. He, along with the French public wanted Germany put to the sword and brought to its knees so it could never devastate France in way it did, again. – Germany stripped of its colonies and acquired lands such as the Alsace-Lorriane, the Saarland and areas of Prussia. Although the world was now at peace, the response in Germany was not positive. Add to the mix that Italy was also dissatisfied at being marginalised in proceedings, led to the melting pot that was the inter-war period. Previous story What was the smartest species of dinosaur?